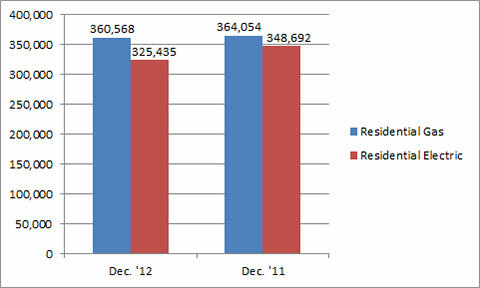 U.S. shipments of residential gas storage water heaters for December 2012 decreased 1.0 percent, to 360,568 units, down from 364,054 units shipped in December 2011. 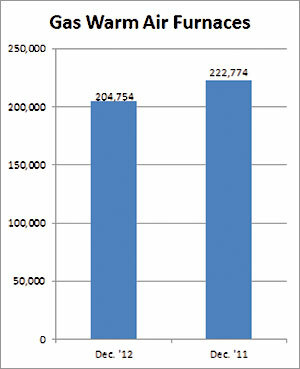 Residential electric storage water heater shipments decreased 6.7 percent in December 2012, to 325,435 units, down from 348,692 units shipped in December 2011. For the year-to-date, U.S. shipments of residential gas storage water heaters increased .2 percent, to 3,959,444, compared to 3,953,113 units shipped during the same period in 2011. Residential electric storage water heater shipments decreased .1 percent year-to-date, to 3,733,988 units, compared to 3,738,882 units shipped during the same period in 2011. 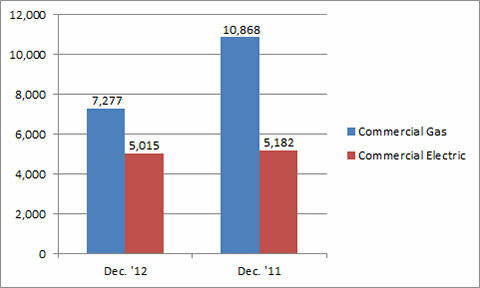 Commercial gas storage water heater shipments decreased 33 percent in December 2012, to 7,277 units, down from 10,868 units shipped in December 2011. Commercial electric storage water heater shipments decreased 3.2 percent in December 2012, to 5,015 units, down from 5,182 units shipped in December 2011. Year-to-date U.S. shipments of commercial gas storage water heaters decreased 5 percent, to 80,490 units, compared with 84,705 units shipped during the same period in 2011. Year-to-date commercial electric storage water heater shipments increased 11.6 percent to 67,265 units, up from 60,257 units shipped during the same period in 2011. 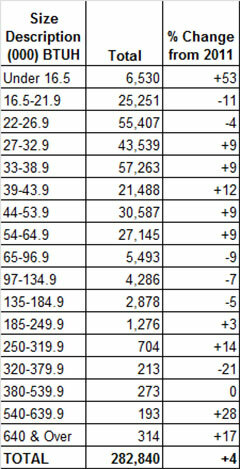 U.S. shipments of gas warm air furnaces for December 2012 decreased 8.1 percent, to 204,754 units, down from 222,774 units shipped in December 2011. 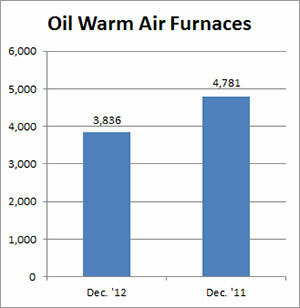 Oil warm air furnace shipments decreased 19.8 percent, to 3,836 units in December 2012, down from 4,781 units shipped in December 2011. Year-to-date U.S. shipments of gas warm air furnaces increased 1.2 percent, to 2,243,397 units, compared with 2,216,160 units shipped during the same period in 2011. Year-to-date U.S. shipments of oil warm air furnaces decreased 25.4 percent to 35,980, compared with 48,247 units shipped during the same period in 2011. U.S. shipments of central air conditioners and air-source heat pumps totaled 282,840 units in December 2012, up 4 percent from 271,967 units shipped in December 2011. U.S. shipments of air conditioners increased 5.1 percent, to 182,323 units, up from 173,435 units shipped in December 2011. 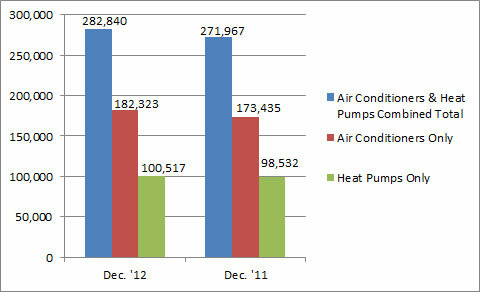 U.S. shipments of air-source heat pumps increased 2 percent, to 100,517 units, up from 98,532 units shipped in December 2011. Year-to-date combined shipments of central air conditioners and air-source heat pumps increased 1.9 percent, to 5,613,665 units, up from 5,509,693 units shipped in December 2011. Year-to-date shipments of central air conditioners increased 4.6 percent, to 3,915,869 units, up from 3,744,691 units shipped during the same period in 2011. The year-to-date total for heat pump shipments decreased 3.8 percent, to 1,697,796 units, down from 1,765,002 units shipped during the same period in 2011.